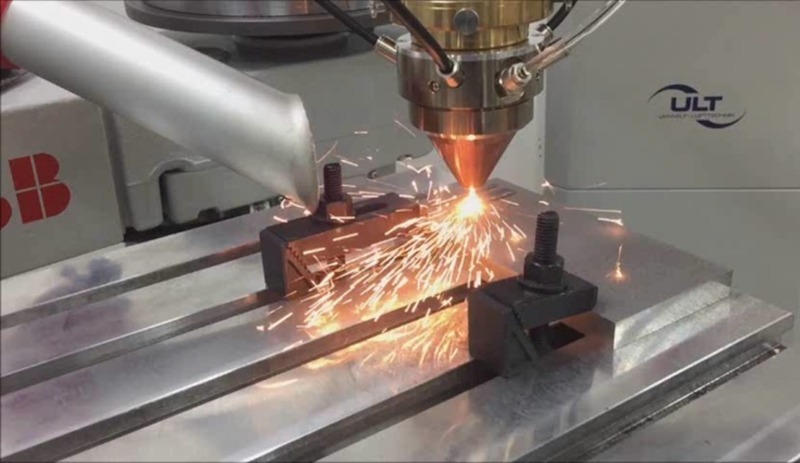 The Department of Defence and RUAG Australia have successfully completed a program to develop and demonstrate laser additive deposition (LAD) as a technology for repairing damaged high strength steel aircraft components. The full repair and return to service of an arrester hook from an F/A-18 Hornet belonging to the Royal Australian Air Force proved these capabilities. The Department of Defence has invested substantially into developing the in-country LAD repair capability, RUAG’s most recent effort for rectifying the effects that impact, wear and corrosion have on Defence equipment. LAD is an additive material technology (AMT) that rebuilds damaged metal surfaces. A high power laser beam creates a melt pool in the surface. Metal particles are injected into the melt pool, and fuse with the surface as the surface cools and solidifies. Overlapping passes build a 3D deposition structure, which can then be machined to the required shape. LAD is applicable to the repair of high strength metal components and structures. Neil Matthews, senior manager for advanced technologies and engineering services, RUAG Australia, said, "Additive material technologies such as LAD are now critical to sustaining Defence’s equipment in the air, land and sea environments." He points out further that "the long-term cost reductions are significant as the reliable repair of components lowers the overhead attributed to logistics and inventory". As part of the LAD technology validation, in a real component repair situation, RUAG successfully repaired a high strength steel arrester hook from a RAAF F/A-18 Hornet. The hook had been previously identified as worn 'beyond safe limits', due to operational activities. LAD technology restored the hook and ensured it met operational and design requirements. At the same time, the full repair significantly improved the component’s return-to-service time, as compared with the typical replacement options. "To date, the Australian Department of Defence and RUAG have recovered more than $6 million of Defence equipment using additive material technologies. Reliability and repeatability are the keys to fully leveraging AMT such as RUAG’s Laser Assisted Deposition and Supersonic Particle Deposition repair and recover capabilities. Adding AMT to repair capabilities is essential in view of the advanced materials and innovative manufacturing techniques used in building RAAF’s Joint Strike Fighter, for example," Khan Sharp, research leader for aerospace materials technologies, Defence Science and Technology Group (DSTG), explained. RUAG Australia is a major industry research centre for the development and application of powder deposition technologies focusing on both supersonic particle deposition (SPD), sometimes referred to as cold spray, and LAD for defence applications. "Defence and RUAG recognise the important contributions made by the Capability Acquisition and Sustainment Group, Defence Aviation Safety Authority, Defence Science and Technology Group, Defence Material Technology Centre, Monash University, Swinburne University and RMIT University," Sharp added. These technologies offer a number of exciting and cost-effective outcomes, particularly in the areas of geometry restoration and corrosion protection. In addition, these technologies enable the restoration of corroded/damaged metallic components/structures to an acceptable level of structural integrity and functionality. RUAG Australia maintains and operates a fixed and mobile SPD capability as well as a fixed LAD capability. RUAG develops and markets internationally sought-after technology applications in the fields of aerospace and defence for use on land, in the air and in space. Fifty-six per cent of RUAG’s products and services are destined for the civil market and 44 per cent for the military market. The group is headquartered in Bern (Switzerland). It has production sites in Switzerland and in 15 other countries in Europe, the US and Asia-Pacific.